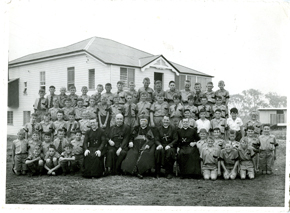 The great influx of migrants after the war had placed overwhelming pressures on the Catholic Education system and in the mid-1950s the Missionary Oblates of Mary Immaculate received many invitations to open schools in various dioceses throughout Australia. The Oblates had very little money for a venture into education, however Archbishop Sir James Duhig promised them a gift of land if they would establish a boys’ college in his diocese. Cambridge graduate Fr Tim Long OMI had arrived in Australia from, the then, Ceylon where he had been Rector of St Patrick’s College. Fr Long had spent thirty-four years as a respected educator and, together with the Oblate Provincial in Australia, Fr Edward (Ned) Ryan OMI, he accepted the Archbishop’s offer. The thirty-two acre site at Lindum was favoured because of the growing bayside district, the working-class nature of the area, the lack of any Catholic college for boys nearby and the site’s proximity to the railway. Fr Long was a man of faith and vision, a motivator who fired others with enthusiasm. He believed sincerely that everything was possible and that the impossible took only a little longer. With his colleague, Fr Denis McCarthy OMI, he arrived on the property on 1 October 1957. They had virtually no money and had a mere four months to get the site and its sparse buildings ready for a school to start on 28 January 1958. The local families gave the Oblates enormous support. The derelict farmhouse on the property was raised from its decaying stumps and relocated on the property on concrete pillars 12 feet above the ground to provide an area for two classrooms underneath and living quarters for the priests. While Fr Long had the vision, it was Fr Denis McCarthy who had the strength and energy to drive it. It was on his broad, young, Irish shoulders that much of the pioneering work was carried. He rallied the local families, raised funds in a myriad of creative ways, dug ditches and drains, carved out the driveway with his own hands, cleared scrub and planted trees. No one worked harder than he to ready the playing fields and classrooms for the boys, and in doing so he established the foundations of community, loyalty and faith that Iona rests upon today. The name ‘Iona’ was chosen in recognition of the Isle of Iona off the west coast of Scotland. Irish Christian missionary St Columba O’Donnell, with a group of twelve followers, came to the island in the 6th Century and established a monastery. The Isle of Iona became a venerated seat of learning and prayer from which missionaries were sent out to spread the Good News to all parts of the known world. The vision of Frs Long and McCarthy was to establish a school that embodied that same legacy of learning and prayer, and so it was that the name ‘Iona College’ came to being. Iona College opened its doors on Tuesday 28 January 1958 with an enrolment of 58 students. There were four staff members – founding Rector Fr Tim Long, Fr Denis McCarthy, Fr Tom Shortall and Fr Michael Clarke. In all, since this time, 49 Oblates have served the Iona community, and nine old boys have been ordained Oblates themselves. Since the humble beginnings, Iona has educated over seven thousand students. The College boasts a Rhodes Scholar, Dr Tom Ward (’96), and many graduates lead successful lives in business, academic, technical, community, sporting and cultural endeavours. Even after sixty years, some of our earliest families still share their lives with Iona. These families worship at the Iona Chapel on Sundays. They are grandparents and parents. They are old boys. They are staff and former staff. May God continue to bless Iona College. May we continue to tell our story as the years go on, as more and more boys and their families are enfolded into the ethos and the spirit that has made Iona the respected school it is today. The outstanding College we have today is the gift to us from so many who have gone before us. Let us never forget our humble beginnings, the unconditional love and generosity of so many who believed in the vision and worked to make this school a reality – here on the hill at Lindum.